As mentioned previously, Kobe's economy developed in tandem with its port and was supported by basic manufacturing industries, or smokestack industries, such as shipping, shipbuilding, steel, and rubber. Following the end of the Second World War, and throughout the high-growth period of the Japanese economy, growth was seen in the steel and shipbuilding sectors. There was also a build-up of electrical equipment and general machinery manufacturers as offshoots of shipbuilding. However, as Kobe is geographically contained between the mountains and sea with little land available for development, the difficulty of obtaining land for production facility expansion has been a problem. In addition, the oil shocks in 1973 and 1978, the imposition of surcharges on Japanese imports, the de-linkage of the U.S. dollar from the gold standard and related policy changes by the Nixon administration in 1971 (known as the "Nixon shocks"), and the sudden upward valuation of the Japanese yen in the wake of the Plaza Accord in 1985, have all acted to mercilessly degrade the production capacity of Kobe's smokestack industries. In order to encourage new business in the face of these circumstances, the city of Kobe pushed for maintenance of industrial areas in waterfront and inland areas, as well as promotion of the city as a center for fashion industry conventions and international tourism. In 2012, the number of business establishments within Kobe city limits was 67,806, and the number of employees was 708,951. In 2010, the total amount of goods produced within city limits was equivalent to 6,241 billion yen and accounted for a 1.3% share of the nationwide total. Prior to the Great Hanshin-Awaji Earthquake in 1995, Kobe's share of the national total was 1.3%. 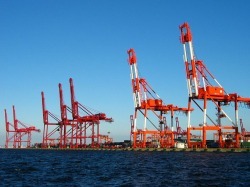 The real economic growth rate in Kobe was +5.6% in 2010. Primary industry is 0.1%, secondary industry 23.1%, and tertiary industry about 76.8%, secondary industry's share has fallen as tertiary industry continues to gain ground. This is an indicator of the progress being made in the revitalization of Kobe's economy with an emphasis on the service industry.